Spirals are everywhere in nature. From the swirls of water going down the drain, to the whorls of a snail shell, to galaxies far, far away. When I knit the prototype of this hat, I was thrilled at how the yarn over eyelets spiraled away from the crown down around the head. Some Google image searching led me to Messier 51, also known as the Whirlpool Galaxy, which was first discovered by Charles Messier in 1773. It lies within the constellation Canes Venatici (the hunting dogs of Boötes the Herdsman). The swirling arms of the galaxy are just like the swirling lines of eyelets in this pattern. 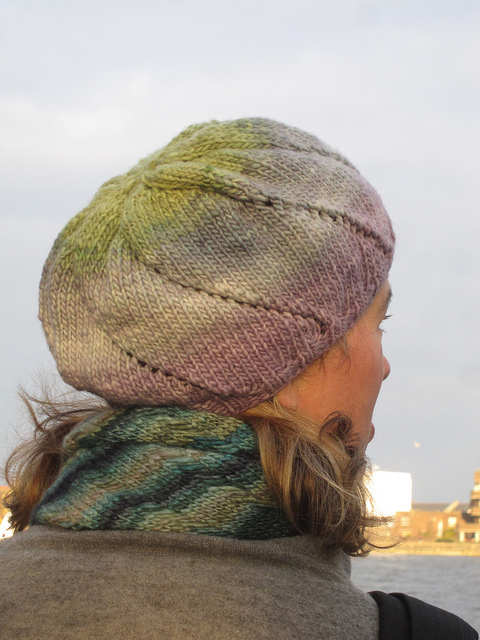 This lovely hat is a great way to use up that one-of-a-kind hank of handspun you’ve been saving. Starting at the top means you can increase to whatever size you desire (close fitting or slouchy), work straight until you’re getting low on yardage, and then decrease and work the ribbing until you’ve finished up every last inch of yarn. It can also be knit using commercial yarn. Pattern includes directions for spinning an appropriate singles yarn, and tips on adjusting size and ease to suit. Please note: pattern includes two files, one with color pictures, and one without pictures for ease of printing. Spinning a thicker single (DK-aran weight ideally). Casting on, working i-cord, knitting in the round, increasing (kfb and yo), decreasing (k2tog),purling, binding off. As desired – anywhere from baby to adult, depending on the amount of yarn. Shown in handspun Porpoise Fur Corriedale in “Parakeet”, 100 yds/2 oz (green-blue hat) or Knitwhits Freia Handpaints Freia Ombre worsted, 127 yds/75 gr (green-grey-purple hat). Variable - use a needle size appropriate to your yarn.